You may experience symptoms ranging from occasional sensitivity to hot and cold foods, to constant throbbing or a dull ache, to pain on chewing. The extent of damage can be assessed by a comprehensive dental examination. Your dentist takes a dental history, examines your teeth and gums, and x-rays your teeth to examine the underlying roots and bone. After your history is taken, your dentist will examine your teeth - looking for cavities, assessing the condition of any fillings you already have, check to see if your teeth are sensitive to hot or cold, check for loose teeth, tap on your teeth to check for pain, and evaluate the condition of your gums. X-rays allow your dentist to see the inside of your teeth and the surrounding bone. With an x-ray, your dentist can detect any unhealthy changes in your teeth or bone, irrespective of whether they are causing any symptoms or not. Your tooth has two basic parts: the crown is the part you see above the gum, and the roots anchor your tooth to your jawbone. Inside the crown and roots is soft tissue (pulp) that helps keep your tooth nourished. Crown: An outer enamel layer and the dentin inside protect the tooth's underlying structures and prevent bacteria from entering the tooth. 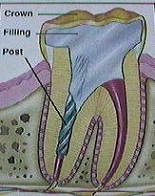 Root: the root canals house the pulp and extend to the underlying bone. The pulp helps nourish the tooth and is made up of tiny blood vessels and nerves. 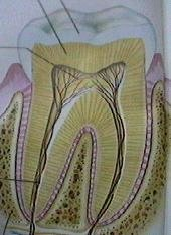 The blood vessels carry nutrients to the tooth, and the nerves give feeling to the tooth. The bone holds the tooth with the help of tiny ligaments attached to the roots. 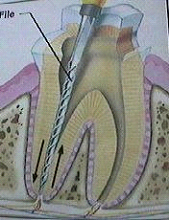 The pulp tissue enters and exits through openings at the root tips. Bacteria can invade your tooth through a loose filling, a cavity, or a crack. Your pulp becomes infected as it is attacked by bacteria. Eventually, the bacteria may destroy the pulp. The inflammation and infection spread down the root canal, often causing sensitivity to hot or cold foods, throbbing, aching, or pain when you chew. This may lead to the bone getting infected as the bacteria escape through the root openings. The bone breaks down, and your ligament surrounding the root may swell and loosen the tooth. The goal of root canal therapy is to improve the health of your damaged tooth. 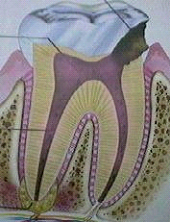 During treatment, the pulp is removed from your root canals through a small opening in the crown. Then the canals are cleaned and disinfected. The adjoining diagram shows an instrument being used to clean the canal. Treatment may take one or more visits. The tooth is first numbed. An opening is made in your tooth and any existing fillings or decay is removed. Then your dentist removes unhealthy pulp with tiny, flexible files. Using delicate, up-and-down motions, your dentist gently cleans and smooths your canals to disinfect them and prepares them for filling. The canals are then sealed with an inert material that occupies the space vacated by the removal of the pulp. After the inside of your tooth has been treated, the outside will be restored to protect your tooth's underlying structures and to bring the tooth back into function. Your dentist will usually cover the tooth with a ceramic or metal crown. After root canal therapy, your tooth continues to be nourished by the surrounding gums and bone. 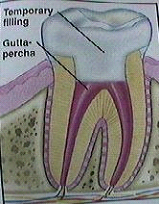 After root canal therapy your tooth should function and feel like your other teeth. Take care of your treated tooth the same way you would your other teeth. Brush after every meal, and floss before going to bed. Also, have regular dental checkups, cleanings, and any other dental work in Pune you may need so that your teeth last as long as you do!